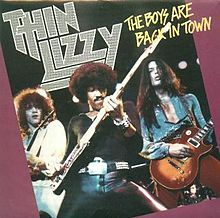 The boys are back in town: Oh, cool, the boys are back in town. I don’t know why you’re telling me, but I guess it’s good to know. The boys are back in town: Umm…yeah. I heard you the first time. Got it. Thanks. Next? The boys are back in town: Is this really what we’re doing? You’re just going to repeat the same lyric? The boys are back in town: Now I’m worried. Are you having a seizure? Give me a signal–bite your tongue twice if you’re having a seizure. The boys are back in town: Okay, now I’m getting angry. This is the fifth time you’ve told me. I have better things to do than listen to you ramble. The boys are back in town: I’m not even going to dignify this with a response. Spread the word around: Sweet mother of Mary! You do know other words! However, are you really telling me to spread the word around? If you have the time to tell me SIX times in a row that the boys are back in town, you can spread the word around a bit. The boys are back in town: Look, I know we just met, but I will cut you. The boys are back in town again: Please make it stop. That is all I have to say about this song. This entry was posted on Wednesday, April 17th, 2013 at 12:40 am	and is filed under music. You can follow any responses to this entry through the RSS 2.0 feed. I really appreciate you getting this song stuck in my head for the bulk of yesterday. Honestly, I had a dream last nite about the guitar solo. Shoot, now I have the song stuck in my head! I hope the dream was better than the song.